RoboRealm -http://www.roborealm.com/help/Surveyor_SRV1.php - The SRV-1 can now be directly controlled from RoboRealm, a very popular Windows-based machine vision software package for robots. The RoboRealm extensions for SRV-1 allow creation of scripts that combine image processing on live video feeds from the robot, e.g. color filtering, blob detection/tracking, edge detection/outlining and feature extraction, with decision processing and robot motion control, making it easy to create behaviors such as object location and tracking, obstacle avoidance, motion detection, notification, etc, with a web interface, and control can be scripted from C/C++, Python, Java, C#, Lisp, Visual Basic, WScript and COM through the RoboRealm API. Microsoft Robotics Studio -http://www.surveyor.com/MSRS.html - Drivers for the SRV-1 in Microsoft Robotics Studio are now available. MSRS is a Windows-based environment for academic, hobbyist and commercial developers to create robotics applications across a wide variety of hardware. Key features and benefits include: end-to-end robotics development platform, lightweight services-oriented runtime, and a scalable / extensible platform. Webots - http://www.cyberbotics.com - SRV-1 support is now included in Webots mobile robotics simulation software. 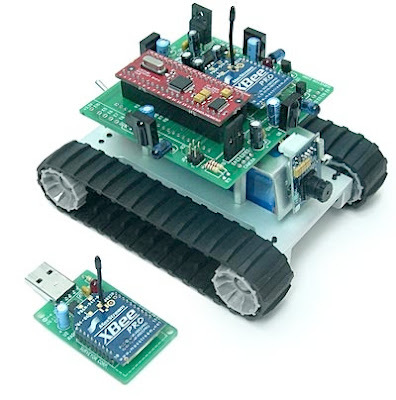 Webots provides a rapid prototyping environment for modelling, programming and simulating mobile robots under Windows, Mac OS/X and Linux. The 3D modeling and physics are outstanding.